Wheels debuted on November 1, 1999. This is the first strip after I started as writer and artist, on December 13, 1999. It looks like I don’t have copies of anything earlier. Jennie was my unofficial co-writer. Today’s (?) strip was one of her ideas. Note: if you came here for programming stuff (and you’re reading this instead), consider subscribing to my programming feed instead of my general feed. A little over ten years ago, I did a brief stint as a webcartoonist for hire. I was working for a Web development company, and my boss sold a client on the idea of putting an original daily comic on their site, as a way to get return visitors and word-of-mouth advertising. The comic was paired with a joke-of-the-day e-mail, which really was there to serve as the RSS feed for the comic, except that nobody had heard of RSS yet. 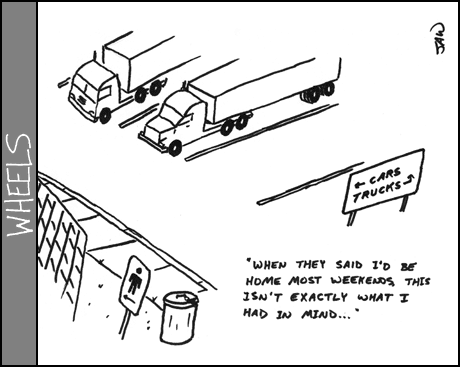 The client was in the trucking business, so the comic, naturally, was trucker-themed. It was called “Wheels”. I took over as writer/cartoonist about halfway through the run. The previous cartoonist had been getting paid for her work, but I wound up not earning a dime for my month-and-a-half run (there were miscommunications). But I found that I enjoy writing funny stories about misfit characters (as reprised in “The Littlest Evil Overlord”), even if I can’t actually draw characters that look the same two days in a row. At the end of the initial three-month run, the client canceled the project, having found that they really weren’t very good at marketing a webcomic to their customers. Thus ended my brief, not-so-lucrative career as a cartoonist. Shortly thereafter, the client got bought out by another company, their old Web site (with the comic on it) was taken down, and my hard work and misfit characters vanished into the dusty archives of memory. Until now. I’ve managed to dig up old copies of all 50 strips I drew, and I’ll be posting them here over the next few weeks for your reading enjoyment (or other emotion, as appropriate). I’ve even got a few ideas for new content, which I might or might not get around to ever writing.